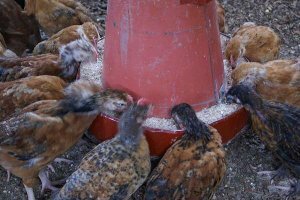 Chicken feed has become very expensive and the only way to make a decent return from rearing chicken for meat or eggs is to make to your own chicken feed. In fact, many Kenyan animal feeds manufacturers make sub-standard feeds so from whatever angle you look at it, you are better making your own chicken feed. The Nation Newspaper recently ran an interesting piece that explained how a farmer could go about making their own chicken feed. If you missed it, here is an extract of the salient points below. Each category of chicken has its nutritional requirement. For example, if we want to make feed for layers, the feed should have at least 18 percent crude protein. If one was to formulate feed for layers, then they would have to calculate the percentage of DCP in each of the ingredients they want to use to ensure that the total crude protein content is at least 18 percent. Farmers who need raw materials for feed making including feed additives (pre-mixes and amino acids) can order them from agro-veterinary shops nearest to them.